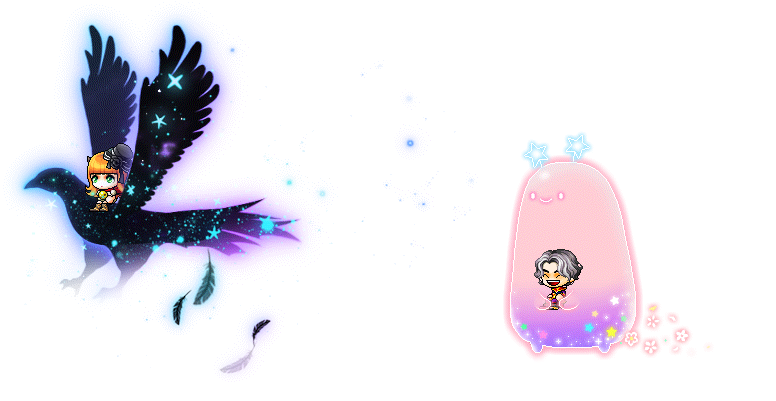 The Great Gachapierrot has added lots of new items! Pick up the new Sugar Explosion Chair,*Snooty Tea Party Group Chair*(use this chair near a friend with the same chair to make an effect appear! ),*Wildflower Festival Chair, and*The Clink! Take a seat on the*Spring Flower Chair,*Blooming Angel Chair,*Flower Field Chair,*Ryko Chair, and*Orchid's Bunny Doll! Hop on the*Moon Bunny Chair and*Dozing Duckling Chair! 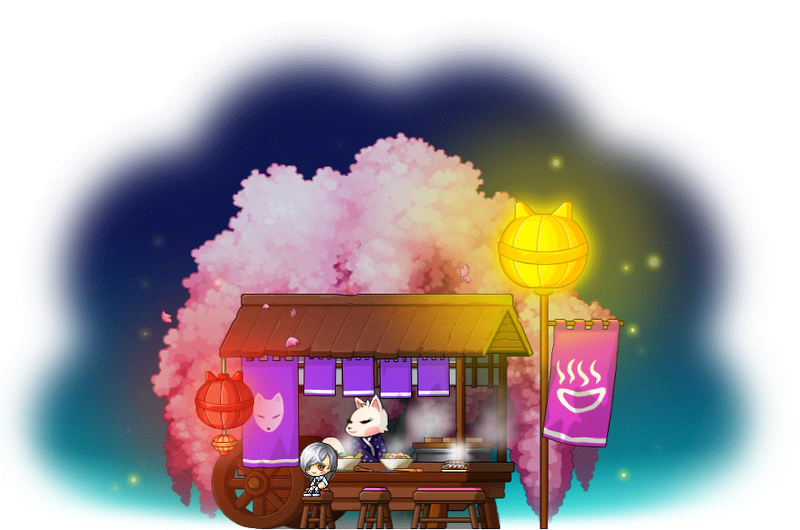 Enjoy the Rock Spirits Chair,*Cherry Blossom Picnic,*Pull the Rabbit's Carrot Chair,*Rabbit Sofa,*Candyflower Chair, and*Bunny Tornado Chair! Light up your life with the*Rabbit Lamp Chair! Each time you sit on it, it changes color. Get a hot bite to eat with the*Spring Snack Bar Chair! Take off with the new*Eclipse Bird Mount and*Spring Creature Mount! These mounts are both available as permanent versions. Get ready to ride with the Kid Cloud Mount,*Aurora Doe Mount, and*Mystical Butterflies! *These mounts are all available as permanent versions. Catch a ride with the Fly! Zoom with Bunny Mount,*Giant Rabbit Mount,*Shopping Cart Mount, and*Cat Cushion Mount! *These mounts are all available as permanent versions. Bring a familiar along on your journeys, including*Necro Lotus,*Necro Damien, and*Verus Hilla! Get some backup with these returning familiars, both available as permanent versions! Say hello to the Despairing Wing*and*Despairing Blade*familiars! New mounts have also come to Andersen's Box! Get*the*Eclipse Bird Mount,*Spring Creature Mount,*Kid Cloud Mount,*Aurora Doe Mount,*Mystical Butterflies,*Fly! Zoom with Bunny Mount,*Giant Rabbit Mount,*Shopping Cart Mount, and*Cat Cushion Mount! These mounts are all available as 90-day versions. Update your character's look with a Royal Hair Coupon or Royal Face Coupon! Check out the Male Hairstyles available now: Fuzzy Fried Hair (NEW! ), Sherbet Hair (NEW! ), Innocent Hair, Twinkle Hair, Cool Kid Hair, Randy Hair. Check out the Female Hairstyles available now: Fuzzy Fried Hair (NEW! ), Fluffy Puffy Cloud Hair*(NEW! ), Innocent Ponytail Hair, Bestie Girl Hair, Spring Waltz Hair, Bunny Buns. Check out the Male Face Styles available now: Pensive Face (NEW! ), Meow Face, Eyelash Perm Face, Bunny Nose Face, Teary-Eyed Face, Scholarly Face. Check out the Female Face Styles available now: Sunny*Face (NEW! ), Moonbeam Face, Eyelash Perm Face, Bunny Nose Face, Eyeline Face, Eyes-On-You Face. Join the Stellar Detectives with an adorable pet of your very own! Choose from Detective Tutu, Detective Nene, or Detective Lingling, or take home all three. Each pet comes with an equip to wear, pet food to eat, a Pet Name Tag, and some useful pet skills and scrolls. Get yourself a friendly companion with the adorable Detective pets! *Choose from*Detective Tutu,*Detective Nene, or*Detective Lingling*and let these little buddies join you on your adventures in Reboot World! Pick up their pet equips too. Give your detective pets a fun fashion accessory with these*permanent pet equips! Give your character some pink candy flair with these*Sugarsweet Candy Permanent Outfit Packages! 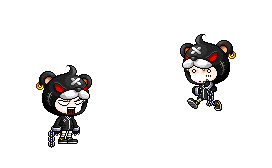 Drape yourself with the Delinquent Bear outfit package, which contains permanent items! This weekend, we will be having a special deal on*4-Hour and 1-day 2x Drop Coupons! Get twice the amount of drops for 4 hours or one whole day! You have until 12:59 AM PST / 3:59 AM EDT / 9:59 AM CEST / 5:59 PM AEST to purchase these items. Make sure to move them from your cash inventory to your item inventory and use them soon! These coupons can only be used at Lv. 249 and under. [Updated April 10] We have removed the Detective Pet Package because it was being sold at a price that we did not intend. We have adjusted the individual pet packages in that sale so that each pet has a permanent duration now rather than a 90-day duration.